Samantha Flores, left, ’17 Psychology, is an IT Services student assistant who is serving as a liaison for computer science students piloting new applications such as Cisco Spark. 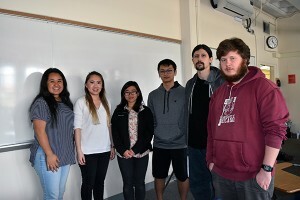 Debra Caires, a computer science lecturer and director of the internship program in the College of Science, transformed her Technical Writing (CS 100W) courses into a service learning class so that her students would get real-life experience. Her students work with clients to identify and solve a problem in a way that is transferable, sustainable and scalable, just as they would if they were working in the programming industry. In Caires’s classes, groups of students are paired with a client – a faculty member, staff member, student organization, small business or nonprofit representative – who needs help in using technology to solve a real-life problem. Caires said the “tidal wave” of new technologies on campus can be intimidating, but her students can serve as technology ambassadors by helping their clients to implement the resources available at SJSU. Caires selected three groups of students this semester to oversee a pilot of new online tools, including IBM’s Watson Analytics, a predictive analytics and data visualization tool; Adobe’s XD, a user experience application; Adobe’s Voice, an animated video tool; Adobe’s Slate, a visual storytelling application; and Cisco Spark, a tool that incorporates secure messaging and video conferencing. The three groups of students will be working with their clients, and will also be reporting back to IT Services (ITS) student assistants on any feature requests or bugs they find while using the new Cisco Spark application to improve user experience. The IT student assistants who will serve as liaisons include Sri Krishna Kadiyala, ’17 Bioinformatics Engineering, Jose Lupercio, ’17 Justice Studies, and Samantha Flores, ’17 Psychology. The students are using agile project methodology, a technique that breaks large projects into smaller milestones that must be completed in a “sprint” of two weeks. The students will conduct five sprints throughout the semester and will present the final outcomes of their projects on May 6, from 9 a.m. to noon, on the second floor of MacQuarrie Hall. The students spent their first two-week sprint researching agile project methodology while getting familiar with Cisco Spark, as well as other applications such as Google Calendar and Slack. “I like that we focus on what we can get done quickly rather than the whole project,” said Eric Fonseca, ’17 Computer Science. “This IT project and working with students is providing me with a great opportunity to develop the leadership skills needed in my future endeavors,” Flores said. 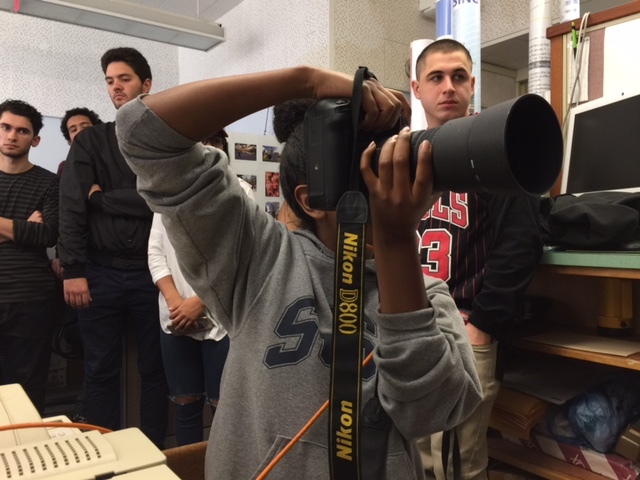 Beginning Digital News Photography (JOUR 95) student Raven Swayne gets hands-on practice shooting a portrait with studio lighting in University Photographer Bob Bain’s office/studio. The students also learned to use Adobe Lightroom. More than 50 San Jose State staff and faculty members attended the Fourth Annual Adobe Day at the software developer’s downtown offices. The half-day session with the Adobe Education team offered a chance for SJSU staff and faculty to use digital tools in guided training sessions that they can replicate on campus. After the presentation from Abobe’s team on March 4,Journalism and Mass Communication (JMC) Professor Michael Cheers introduced the new visual storytelling tool Slate to his students the following week. He will also be introducing another new tool, Muse, a responsive web design tool, after spring break. Cheers said access to the latest software, including tools in Adobe’s Creative Suite such as Photoshop, Adobe Premier Pro and Lightroom, are integral to preparing his multimedia students for internship and entry-level positions involving photography and video. To help students learn the intricacies of the programs, Cheers hosts labs on weekends and before class, and also posts tutorials and visual storytelling examples on Canvas.